It’s rare to talk about therapy for your knees without discussing the low-impact benefits of cycling and elliptical workouts. Both are forms of exercise for knee injuries because keeping your knees mobile and strong can minimize further damage. Knee damage varies drastically and therefore understanding the differences between cycling and elliptical can help you and your doctor determine the best approach. The key differences relate to joint forces, body position and muscle activation. Cycling and the elliptical are both useful tools to work on knee range of motion, strength and endurance without putting large forces on your knees. Research published in the November 2008 issue of "Clinical Orthopaedics and Related Research" found that cycling resulted in lower joint forces compared to the elliptical, and the elliptical had similar levels of knee impact compared to walking. Therefore, people with severe knee damage, from degenerative conditions such as osteoarthritis, may benefit more from cycling due to less impact to the knee joints. The elliptical requires more weight-bearing than cycling because it mimics walking yet involves more hip, knee and ankle range of motion. It requires balance and trunk control while maintaining an upright posture. This is beneficial and translates to the way your knees are used every day. However, the elliptical can be challenging for people with more involved knee problems or other health issues. 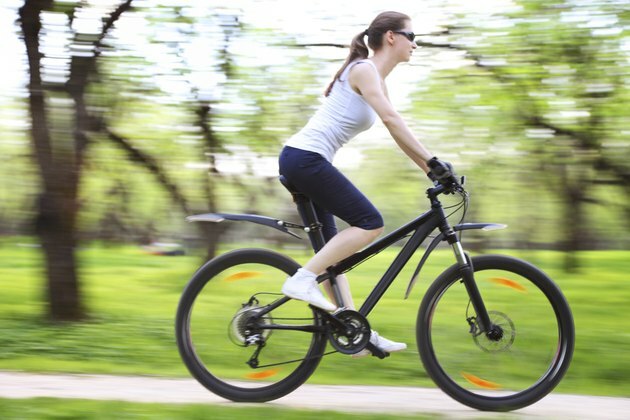 Biking provides an option for people who have difficulty with balance or standing upright, even allowing a recumbent position with increased seat and back support. Although cycling and the elliptical can activate your muscles differently, both types of equipment have the capacity to strengthen all the supporting knee muscles. It’s important to adjust the exercise equipment to fit your body type and set the amount of knee range of motion and resistance to levels that are pain-free. Increasing the knee flexion, or knee bend, and amount of resistance will put more pressure on your knees. Therefore, it’s important to find a setting that works your leg muscles but does not increase pain and inflammation in your knees. Knee health is about finding a balance, since both too much and too little impact can be detrimental to your joints. Although cycling and the elliptical are considered low-impact forms of exercise for damaged knees, there are other factors to consider. Time, intensity and frequency of exercise should be monitored so you don’t make your knees worse. If you experience an increase in pain, stiffness or inflammation, you should modify your exercise routine. Consult your doctor for guidance before starting any exercise program for your knees.